I love Thai food. My husband, on the other hand, is a bit apprehensive, because unfortunately, until now, he had only been to one other Thai restaurant, and he didn’t really care for the dish that he ordered. But, when I saw Soi 9 Thai Eatery featured on Living Social, I jumped at the chance to try another Thai Restaurant. Order: My husband and I both ordered the Pad Thai with Chicken ($7.50 per plate), and an order of Poh Peah Tod (Crispy Spring Rolls, $4.50/plate) for appetizer. This has been my first Thai food in a long, long time. Pad Thai is one of my favorite dishes, but, it has been my experience that not all plates of Pad Thai are created equal. I’ve had some really bad Pad Thai, in fact, it’s been many years now, but, once I had Pad Thai with bad shrimp. As in rancid, spoiled, rotten … you know … bad. Since that time, I request no shrimp on my Pad Thai. The horror of that plate haunts me to this day. I have been on a quest of sorts to find a good Thai food restaurant, one I can trust to deliver good Pad Thai. And I think I have found it with Soi 9! This place rocks. I love the atmosphere: a kind of modern-minimalist with touches of industrial kind of feel. But, as much as I enjoyed the atmosphere, the best part of the place is the food, and that’s just the way it should be. We started with our drinks, and I ordered Thai Iced tea … one of my favorite beverages. When in a Thai restaurant, I order Thai Iced Tea! It’s a MUST! And this was prepared properly – the black tea base was good and strong without being bitter. It was strong enough to withstand the sweetening it endures to become Thai Iced Tea – sometimes Thai Iced Tea can be too sweet and you don’t really taste the tea. I’m glad that didn’t happen. Somebody knows what they’re doing at Soi 9. For appetizers, we ordered the crispy spring rolls, which I chose mostly because I knew that my husband would at least enjoy these. And they were very tasty. The wrapper was light and crisp and not greasy. The shredded vegetables were still just a little crunchy. I liked how fresh it tasted. 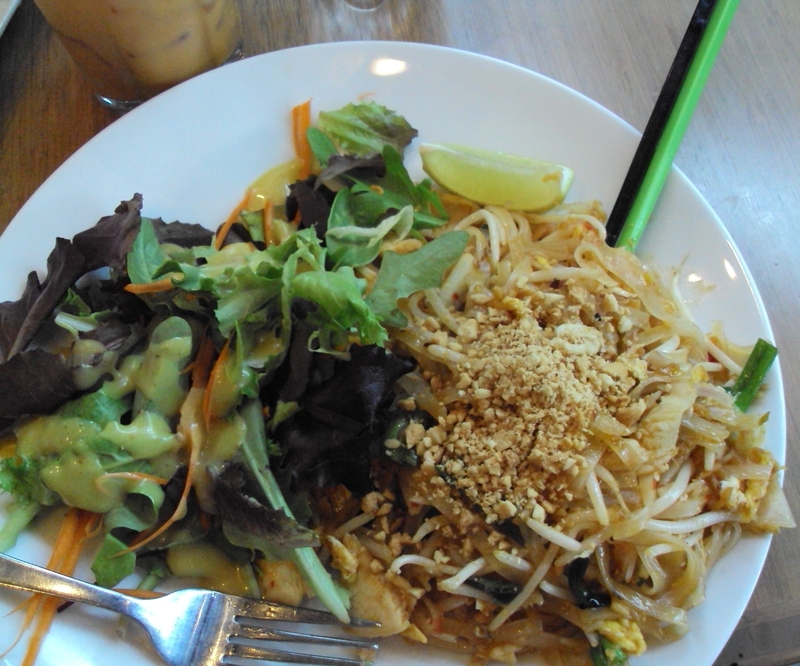 Our lunch plates included a generous portion of Pad Thai and a side of salad made of fresh spring greens and topped with a delicious curry dressing. It was lightly sweet with a hint of curry spice. My husband really enjoyed the dressing, which surprised me because he is usually a ranch dressing kind of guy. The Pad Thai was amazing. The sauce was perfect! It was spicy … but not so spicy that I felt the need to grab the nearest glass of water to extinguish the heat. The sauce didn’t taste overly fishy, it had a really nice balance of flavor, and I liked that the sauce didn’t goop up the whole plate. There was just enough sauce to coat each ingredient without making it a sticky mess. I also liked that the noodles were cooked but not mushy. They were separate, not stuck together. The chicken was tender. This is definitely the best Pad Thai I’ve had in a long time! If you love Thai food – you really should try Soi 9. I was very impressed from start to finish. Our server was very friendly and helpful, and the food was delicious. A perfect lunch. Learn more about Bourbon Barrel Foods here. 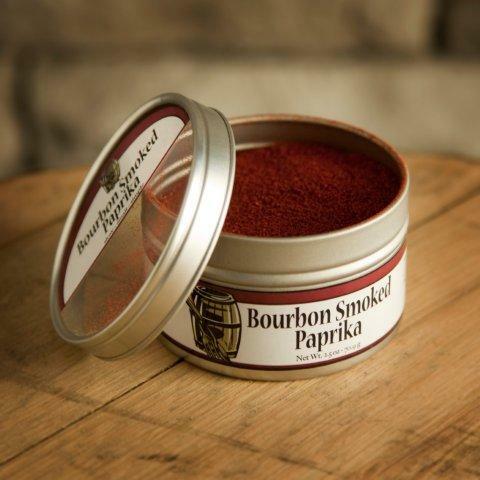 Many paprikas are smoked, but none of them are bourbon smoked. Try this combination of sweet, piquant paprika and the mellow, oaky flavors of fine Kentucky bourbon. To be honest, this was the item I was least excited about in the Bacon and Bourbon Tasting Box. I mean, paprika? Really? We’re talking my least favorite spice. But… let me explain WHY it is my least favorite spice. You see, growing up, the main cook in the household wasn’t exactly a “gourmet chef” by any stretch of the imagination. Sure, most of the food was edible, but, flavorful? That’s another thing all together. Bland would be the way I would describe most of what I ate in my adolescent and teen years. We had a container of paprika in the spice cabinet. It had been there since I was eight (probably longer) and I don’t think it had ever been replaced during the time I lived in that house. The only food that I can remember paprika ever being used for was to sprinkle over deviled eggs, and that was for color, not for flavor (or at least, by the taste of them, I can assume it wasn’t for flavor, because I didn’t taste any difference between those deviled eggs that were dusted with paprika and those that escaped the dusting). So, in my mind, paprika is that spice that is used for color and not flavor. In fact whenever preparing a recipe that called for paprika, I would either omit it, or add something else from my spice cabinet. I never considered paprika a spice worth having in my cabinet … Until now! But with this spice being in my tasting box, it exposed me to the flavor of paprika! When I first opened the tin, I was blown away at the smoky scent. Sweet, smoked, and just a hint of spice. It smells really good. A little taste reveals a profile that is a little bit peppery, a little sweet, and with a lovely dimension of smoke. It is a powerful flavor! I’ve sprinkled this on fried eggs, and it’s spectacular. For Christmas, I made scalloped potatoes, and used 2 teaspoons of this paprika in the sauce and it elevated the dish from ordinary to extraordinary. Move over, nutmeg and oregano, you’ll need to make some room for the Bourbon Smoked Paprika! This spice is very flavorful stuff! My deviled eggs will never be the same! If you suffer from bland food syndrome like I did when I was a kid … get the cook in your house a tin of this! 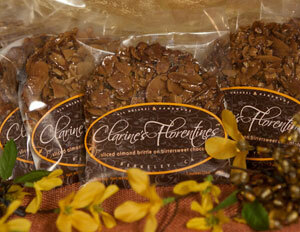 Learn more about Clarine’s Florentine’s here. A favorite from our February Tasting Box, Clarine hand-makes these European-style cookies – a delicate layer of well-caramelized almonds slathered with bittersweet chocolate. As I mentioned on my article about my Stocking Stuffer Tasting Box, this is the product that prompted me to buy this additional box. Sure, I wanted to try the other goodies as well, but, these Florentines have been on my mental wish list for a very long time. And as I also said in the aforementioned article, my Florentines were smashed upon arrival. I was sad. But, I was glad to learn that my Florentines would be replaced, so I wrote to Foodzie and instead of replacing them they are offering me a $5 credit. Nice, but, I am still here, left with crumbled cookies. But they still taste good, even though they’re in small bits. In fact, it might be more in keeping with the whole “Stocking Stuffer” idea, since, if I were a child given a cookie like this, I probably would have broken it up into little pieces to enjoy. Thin slivers of almonds have been caramelized to a dark golden brown, rendering them sweet and chewy from the caramelizing process. The bottom of the cookie is a thin, solid layer of dark chocolate which has just enough of a bitterness to it to give this cookie a sweet yet savory appeal. It tastes very elegant and delicate but at the same time, incredibly indulgent … and I think when served whole, would be even more luxurious! In one bite, I taste a delicious, earthy, nutty flavor, sweet caramel, and smooth, rich chocolate. YUM! For a tea pairing, my immediate thought would be a Keemun, but, perhaps even a Yunnan would be nice. The spicy and earthy tones of the Yunnan would offer additional contrast to the sweet and bitter of the cookie while enhancing some of the earthy tones of the almond. Ultimately, I chose this Yunnan Gold from Teavert. The robust flavor of the Yunnan brought an amazing dimension of flavor to an already decadent treat. Even though they were broken, these cookies are awesome. It’s a little late to be ordering them as holiday gifts, but, they’d make a great Valentine’s gift (I know I’d be really thrilled with a box of these for Valentine’s Day!) And they make tea time extra special! Learn more about Lillie Belle Farms here. This decadent cup is filled with pecan butter, dark chocolate and Maker’s Mark whiskey ganache. Topped with a large caramelized pecan. If you’ve read this blog much at all, you’re probably well aware of my status as a chocoholic. (My name is Anne, I am a chocoholic, and it has been approximately 3 minutes since I last consumed a dark chocolate enrobed bon bon aka the Maker’s Mark Cup from Lillie Belle Farms). But I’m not totally crazy for alcohol. Tea is my beverage of choice, and I really don’t care much for the taste of most alcohol. So, you might be thinking … why would I choose the Bacon and Bourbon box? Mostly for the bacon… Specifically, the Bacon Jam. That’s been on my mental wish list for many months now. But even though I’m not particularly crazy for Bourbon, these Maker’s Mark Cups are tasty enough to possibly make me change my mind! The “cup” of this confection is a thin shell of dark chocolate. It is a delicious, bitter sweet chocolate and it has a fresh snap to it. 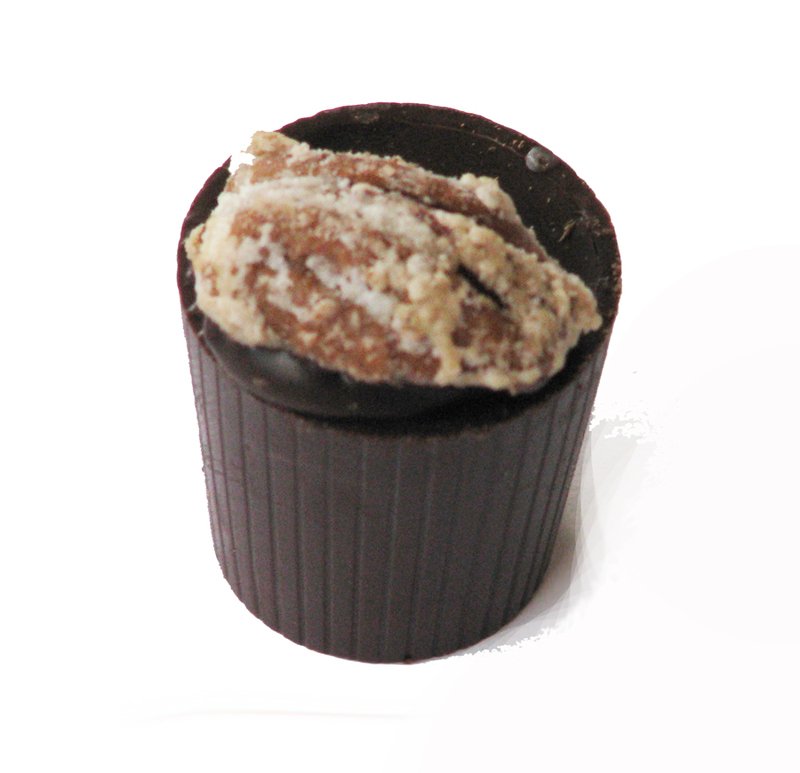 Inside the cup is a creamy, dark chocolate ganache that tastes faintly of pecans and distinctly of Bourbon. The ganache is incredibly smooth and rich, and although the Bourbon is a strong flavor, I am happy to find that the other flavors lend a sense of balance to the confection. And then there is the WOW factor … which is – at least for me – the yummy candied pecan that dazzles the top of this bon bon. Sweet and crunchy and delicious. I think that these bon bons would certainly be delicious without the pecan on the top, but with the pecan … it becomes a superb indulgence. My choice of tea to enjoy with this candy was an unfettered tea as there is plenty of complexity within the confection itself. I chose this Fancy Ceylon from Grace Tea Company. A very memorable tea time! I found this to be a very enjoyable Bourbon infused chocolate … I like that the Bourbon does not overwhelm, as I have partaken of some rather over-infused Bourbon chocolates in the past. These have a really pleasant balance to them. I also love that Lillie Belle Farms is a local business! While Christmas Shopping I Discovered Simply Sweets! I love cupcakes. They are probably my favorite treat … I don’t know what it is about them. Maybe it’s because they’re so cute, maybe it’s because they’re a personal size. But, yeah, I definitely hopped on the cupcake wagon when they became all the rage over the past few years. So, I was very excited to find Simply Sweets during a recent shopping trip at the Vancouver Mall. 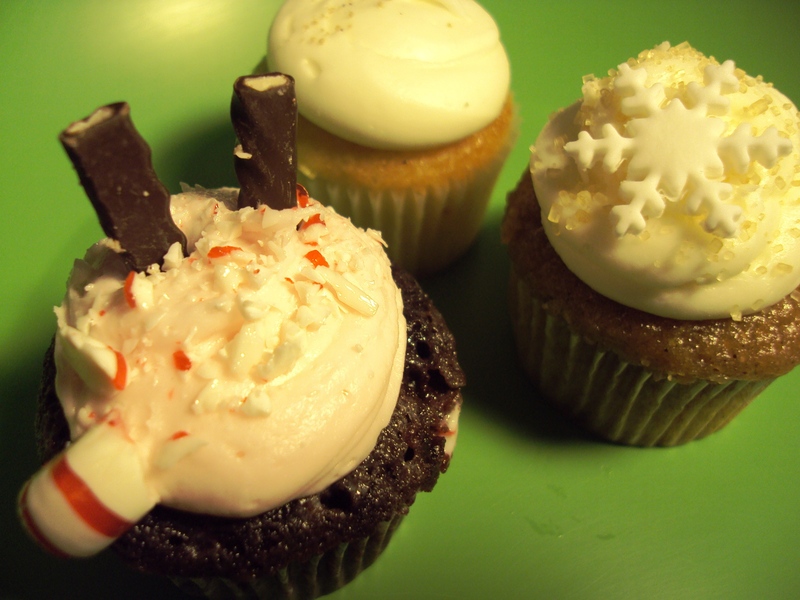 Order: I chose the three seasonal mini cupcakes offered on this week’s menu: Eggnog, Gingerbread & Candy Cane. The Candy Cane cupcake was very tasty. Even though I enjoyed it very much, it doesn’t get my vote for the favorite cupcake because really, it was little more than a chocolate cupcake with vanilla frosting topped with crumbled peppermint candy and two tasty chocolate mint candies. The chocolate cupcake didn’t taste as though it had been flavored with peppermint, nor did the frosting. I think that this cupcake could have been elevated to amazing with just a little more peppermint flavor. But, I think there lies my main disappointment with this cupcake shop. The cupcakes aren’t really all that special. There’s not really much to them. The flavors aren’t all that extraordinary. The frosting is the best part of the cupcake, because it has a nice, fluffy texture and I’m not finding it to be too sweet – you know how some bakery frosting just tastes sickeningly sweet… this doesn’t, and that’s a good thing. Honestly, the best thing about these cupcakes is that I didn’t have to make them myself. I don’t consider myself to be an outstanding baker by any stretch of the imagination … I usually bake from mixes because I don’t like measuring. But, really, I can’t say that these cupcakes tasted better than anything I’ve baked myself. I don’t think I’ll be rushing out to buy more cupcakes from this establishment any time soon. If I happen to be in the mall and I’m in the mood for cupcakes (and really, when am I ever NOT in the mood for a cupcake?) I might stop in. But, I’m not going to make a special trip, because I am not really finding these to be special enough for that trip. Learn more about 479° Popcorn here. Ginger comes from the edible bulb of a perennial plant, and is frequently found in Asian cuisine. 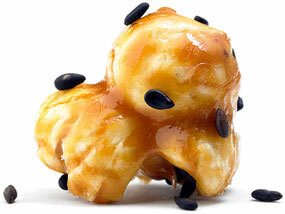 We infuse golden, buttery caramel with organic ginger to create a pleasantly zesty coating for crisp, fluffy popcorn. Finished with a generous sprinkle of toasted sesame seeds, this unique snack displays tingly heat, gentle sweetness and a nutty finish. San Francisco’s Chinatown was our inspiration for this exuberant combination of flavors, and we think it tastes even better with a Bruce Lee movie playing on the flat screen. This has to be the tastiest caramel popcorn I’ve ever tasted. I love the contrast between the sweet caramel and the peppery zing of the ginger. The hint of nutty flavor from the sesame seeds is just barely apparent, but it’s enough to keep the taste buds excited for more. The popcorn is light and fluffy, and now that I am near the bottom of the pouch that was included with my Stocking Stuffers tasting box from Foodzie, I can also say that I found NO un-popped kernels and I’m not really experiencing much of a hull issue either. The caramel is done right. Each kernel of popcorn is covered with no bare spots. It has a nice sweetness, it doesn’t taste burnt, and it has a nice crispness to it, without coming across as too sticky, buttery or messy on the fingers or the teeth. Adding to the crunchy texture are the black sesame seeds, which add a light, toasty nut taste. Every kernel of popcorn seems to have at least one seed on them, so there is a good amount of sesame seeds here, but again, it’s just the right amount … not too much, or too little. Then there is the ginger. I love the kick that the ginger adds to this popcorn, and gives it just the right balance between sweet and spicy. As for a tea pairing … this popcorn has enough flavor going on for it that I’d recommend just a glass of iced tea for palate refreshment! My favorite iced tea: Rainbow Sherbet from 52Teas. Here, the flavors are anything but “simple” but it sure is refreshing with a pouch of this popcorn! I loved this. My only regret that there was just one pouch of it in my box, and now that pouch is empty. I know that my local market carries this brand, although I don’t know if they happen to carry this particular flavor. I hope so and I will check for it the next time I’m shopping. I must have more! My Stocking Stuffers Foodzie Tasting Box has Arrived! As I mentioned in my article about this month’s Bacon and Bourbon Tasting Box, I was tempted and decided that I needed to order an additional box this month. In addition to choosing the Bacon and Bourbon Tasting Box as my monthly selection, I ordered the Stocking Stuffers box, which aside from the fact that there is a bunch of chocolate in this box, there were a couple of items (well, one, specifically) that I had on my mental wish list, and I think that is what ultimately inspired me to order the second box. Unfortunately, that one item that had been on my mental wish list was smashed to bits when I received the box. Sure, it’s a hazard whenever ordering products such as this online, but, fortunately, Foodzie said that they would ship me some more Florentines from Clarine’s Florentines. It’s December, just over a year since we launched the first Tasting Box and we can’t help but look back on the year and think about all the amazing things we’ve tasted. We wanted to bring back some of the favorites that you all couldn’t stop raving about. Of course, we wanted to throw in some new flavors that we can’t wait for more of in 2012 too. We discovered real butterscotch (which we realized we had actually never tasted before) and it’s been one of the products that everyone on the team went nuts over. As they say, the best sweet things come in small packages, and this box is stuffed full of them. Share your past favorites by stuffing some into a stocking of someone you love and treat yourself to the new tastes. 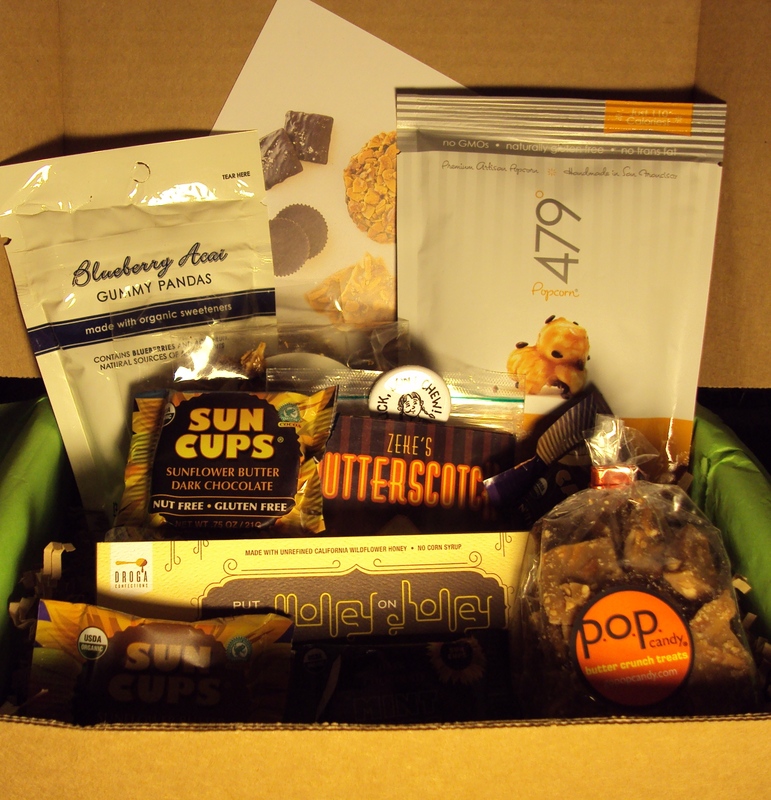 The Tasting Box will be an even bigger part of Foodzie in 2012 and we can’t wait to continue to share our new favorite discoveries with you. As I had mentioned in my article about the November Tasting Box, I was and still am a bit disappointed with the changes at Foodzie. As much as I loved the selections for December (so much so that I couldn’t settle on just one), I really liked the “surprise” of the previous tasting box, and I also liked the more affordable price. I don’t know that I will keep my subscription going, I think I fwill go on a month to month basis … at this point, I shall try January’s box and see how I like it … and if I do, I shall then go for a box in February. And so on. For the time being, though, I am loving the sweets of this box … my sweet tooth happily approves!